It had been a fair wee while since I'd been up a hill, and considerably longer since I had got up a new hill. 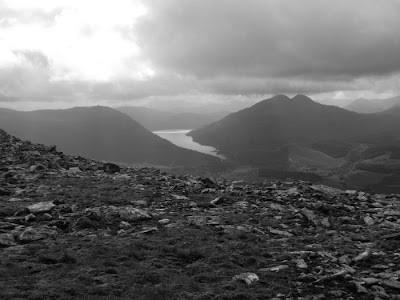 What should really have been a straightforward target of getting 150 different Munros done by the end of the year has gone right out the proverbial windae. I might need a following wind to get to the halfway mark, never mind anything else. 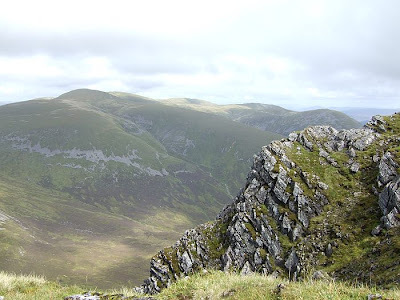 Anyway, determination was once more in evidence last weekend so me & Andy headed up towards Dalwhinnie and then across to Roughburn to have a go at Beinn a Chaorainn and Beinn Teallach. We had one of those lucky days with the weather when it seems to be raining everywhere else, but we pretty much got a hole in the cloud above us all day. Andy took Maura, and I had Molly. 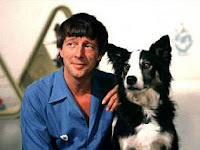 I had been intending to take the Wee Black Dug, but Molly's no' been out on a hill for ages, and she was giving me "yon look" in the house, so I had a last minute change of heart. I bribed Jorja with a bone, but you could tell she wasn't best pleased. Sometimes you just have to cope with the guilt though. We arrived at the roadside parking spot around 11, after what was oddly slow progress on the way up. The roadworks at Bankfoot are no longer a problem, but it just took us longer than anticipated. Mind you, so did the hill so maybe that was just an omen. Through the forest to start with, heading for the firebreak. It turned out there were two firebreaks. We took the first one, and I have no idea if that was right or not. Certainly there was no trace of a path onto the hill proper at that point, but there was very little trace of a path at any point on the walk, except just at the summits, and for a wee stretch on the approach to the top of Teallach. One of the pathless-est hills I've been on, certainly. Unless we were missing the proper route virtually the whole way of course. Not for the first time. It's extremely wet when you emerge from the firebreak and it stays that way until you're well up the hill. We decided to do the route in an anticlockwise direction, and I reckon that's wise. 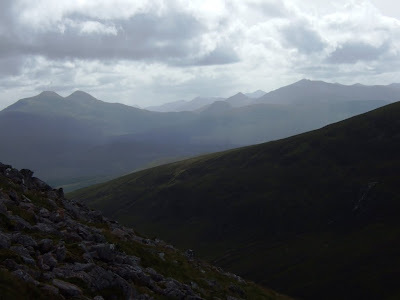 Teallach is a lot smaller than Chaorainn, which gives something of a psychological boost when you're about to start the big descent into the bealach between the pair of them. I think approaching from the other direction might have been too much for us in our (well, my - Andy did the Ring of Steall last week) out of condition state. Three hours to get to the top of the first hill. Nice view of Creag Meagaidh next door. 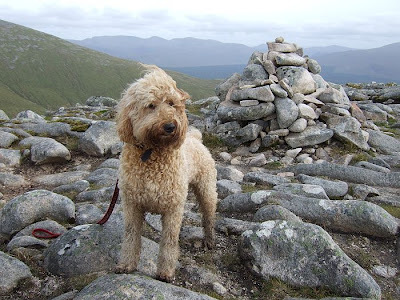 The dugs were off the lead the whole way until just before the summit when the impressive crags led us to the view that we were better being safe than sorry and running the risk of a nervous game bird bursting from cover and creating chaos. Apart from that though, and the surprise appearance of a few sheep near the summit of Teallach, the girls were running about daft the whole day. The second ascent wasn't all that bad, but againg it was boggy and we made heavy weather of it. Took us two hours between summits. Worst part of the day was probably the descent from there which took us through deep, clingy heather interspersed with - yes, boggy wet bits. After that there was a wet river crossing then a very wet muddy wander down virtually the only recognisable path we met all day. This isn't meant to be a moan - I enjoyed it and we got some good views. It was just...wet. And yet not raining. Slightly unsettling.